The luxurious 137 Pillars Suites & Residences Bangkok, located on Sukhumvit Soi 39 in the heart of the Thai capital, will host a Sabre D’Or Gala Dinner on 31 May 2018. The Sabre D’Or Gala Dinner will get underway with a cocktail reception at 7 pm followed by a lavish 5-course dinner at 7.45 pm that will include sumptuous items such as obsiblue prawns, Alaskan crab, duck, halibut, lamb and of course, a delicious and decadent dessert. There will also be a sabrage demonstration by sabre masters from Sabre D’Or and guests will have the opportunity to learn the flamboyant art for themselves. 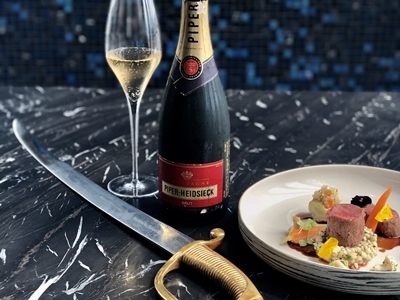 Guests who do wish to sabre a bottle of Champagne, for which there is a charge of THB 3,000++, will receive a personalised ‘Diplôme de Sabreur’ from Sabre D’Or, a pin, as well as the collar and cork of the bottle they removed presented to them in a box.